Today, I submitted public comments to the CA/Browser Forum. CA/B Forum is an industry group started by Certificate Authorities — the companies that sell digital certificates to web sites so that your browser can encrypt your communications and can tell you whether it’s connecting to the genuine site. It is important that CAs do a good job, and there have been several examples of Bad Guys getting fraudulent certificates for major web sites recently. You can read the comments below, or download a pretty PDF version. I am pleased to respond to the CA/Browser Forum’s request for comments on its plan to establish an Organizational Reform Working Group. For more than a decade, Internet users have relied upon digital certificates to encrypt and authenticate their most valuable communications. Nevertheless, few users understand the technical intricacies of the Public Key Infrastructure (PKI) and the policies that govern it. Their expectations of secure communication with validated third-parties are set by the software that they use on a daily basis–typically web browsers–and by faith in the underlying certificates that are issued by Certificate Authorities (CAs). CAs and browser vendors have therefore been entrusted with critically important processes, and the public reasonably relies on them to observe current best practices and to relentlessly pursue even better practices in response to new threats. Professor Ed Felten, while on loan to the Federal Trade Commission for 2011 and Spring 2012, has a new Tech Policy Blog, Tech@FTC. When he’s in his role as Chief Technologist of the FTC, he’ll blog there; when he’s wearing his regular hat as Professor of Computer Science and Director of the Center for Information Technology Policy, he’ll blog here at freedom-to-tinker. Of course, the big news from the FTC this week is the official report, Protecting Consumer Privacy in an Era of Rapid Change, and I see that Ed has something to say about that. But he’s also got an article about SQL injection and our friend, little Bobby Tables. 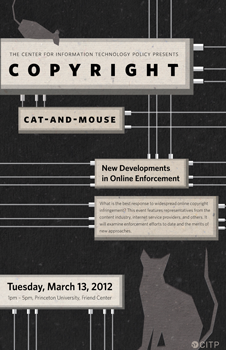 Join Us at Princeton Tomorrow for "Copyright Cat-and-Mouse: New Developments in Online Enforcement"
Tomorrow afternoon, the Center for Information Technology Policy is hosting an event that looks at the state of online copyright enforcement and the policy perspectives of the parties involved. We’ve got a great lineup, with folks from the content industry, internet service providers, web companies, academics, and the press.